With the summer in full swing and a record year already in the books for the Daniel Beer Group at Windermere Homes & Estates, the #1 top producing team for the brokerage is kick starting a huge initiative to give back to the community. Summer 2014 marks the first year of what is planned to be an annual Giving Back to School Program. Anyone who buys or sells a home in the 92127 zip code until September 30th and mentions the program will be able to name a school of their choice and a charitable donation will be made out of the commission proceeds for that transaction. Daniel Beer, the group’s CEO and Listing Specialist, is keen on making a contribution and positive impact on the community. “Initially we were going to select a school to make all donations to, but after discussing the program with multiple clients and area residents, it became clear that this is a highly personal choice for each family and we wanted to offer the maximum flexibility for each of our clients,” says Beer. 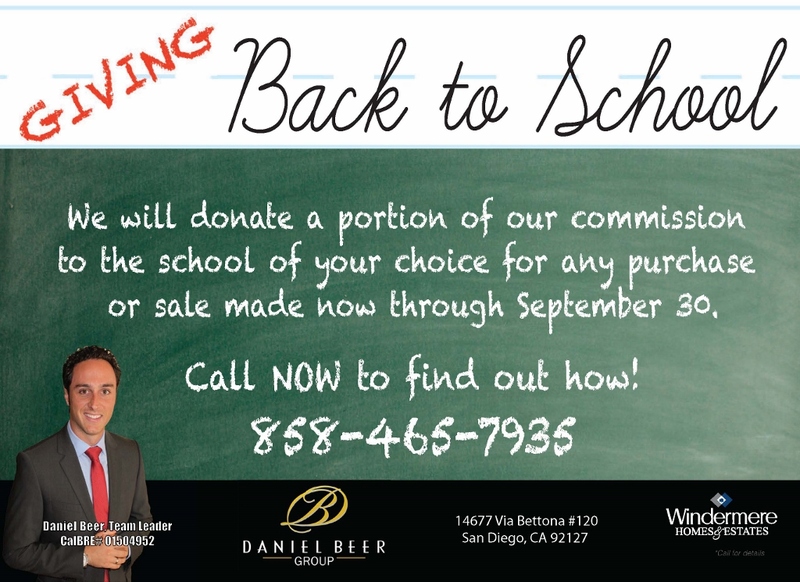 A unique twist to the Giving Back to School Program that is being offered by the Daniel Beer Group is that you may also choose to have the donation made toward the tuition of any child attending a four year university in the fall of 2014 in the form of a college scholarship. Those financial contributions will be made directly into the child’s bursar account to ensure that the money is used entirely for education. For more details on the program please reach out to Lynda Chang, operations manager at the Daniel Beer Group, at admin@danielbeergroup.com. Program ends September 30, 2014.